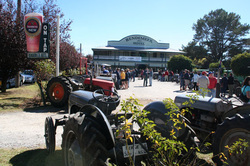 The 5th triennial Grey Fergie Tractor Muster will be held on 21-22 March 2015 in Bendemeer NSW. Bendemeer is located on the New England Highway between Tamworth and Armidale . Come and join us for a weekend filled with excitement and renew old friendships. Accommodation is limited - see below for contact details. ﻿Bendemeer Hotel -﻿ www.bendemeerhotel.com.au or phone (02)6769-6550. To register for the muster, please ﻿click the Register button below. The register button simply click the register button below. You can also contact us via the contact page. © . Grey Fergie Tractor Muster Committee - a Tamworth Regional Council Section 355 Committee. All Rights Reserved.